On 17 May 1988 the former Manawanui was recommissioned into RNZN service as HMNZS Kahu. In 1990 Kahu was part of the RNZN fleet present at the Waitangi Celebrations. From 1988 to 2009 Kahu operated as the navigation and seamanship training vessel for the RNZN for regular and volunteer personnel. Commissioned: As HMNZDT Manawanui 28 May 1979 (pennant A09), as HMNZS Kahu 17 May 1988. This design was developed by the seamanship school at HMNZS Philomel. The badge features the New Zealand native hawk circus approximans whose Maori name is Kahu which is also a term for cloak. The design shows the hawk with a cloak in its claws. The badge was approved by the Chief of Naval Staff on 14 July 1993. Two ships have carried the name Kahu. The first use of the name was for the base establishment of the RNZN Fairmile Flotilla in the Solomon Islands during the Second World War. The base was commissioned as HMNZS Cook II but was changed when the base was moved to Renard Sound in the Russell Islands. The ML attached to the base ML 411 was given the name Kahu. The second Kahu was built at the Whangarei Engineering and Construction and laid down on 8 December 1978. This ship was a lead-ship of an Inshore Patrol Craft type based on the 1970s RAN torpedo recovery vessel although it was built with a larger superstructure. It was completed on 23 May 1979. She was commissioned into RNZN service as the diving tender HMNZS Manawanui on 28 May 1979. Under this name the ship served until 1988. It assisted the recovery efforts on the sunken Soviet liner Mikhail Lermontov in March 1986. In March 1988 the RNZN purchased a larger diving tender. This was commissioned into service as HMNZDT Manawanui. On 17 May 1988 the former Manawanui was recommissioned into RNZN service as HMNZS Kahu. In 1990 Kahu was part of the RNZN fleet present at the Waitangi Celebrations. From 1988 to 2009 Kahu operated as the navigation and seamanship training vessel for the RNZN for regular and volunteer personnel. She also supported the operations of the Operational Diving Team’s diving school and assisted in operations with Customs, Police, Fishers, Department of Conservation, and other Government agencies. During her service Kahu steamed 192.232 nautical miles (356,000 kms) and had been underway for 22,411 hours (934 days or 2.5 years). On 8 October 2009 Kahu made its last port visit when it arrived at Port Whangarei. 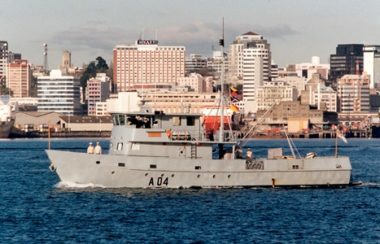 It departed on 12 October and arrived for the last time at the DNB on 13 October flying its 12m long paying-off pennant from the mainmast as is the tradition for ship being decommissioned from RNZN service. The decommissioning ceremony was held at HMNZS Philomel on Thursday 29 October 2009. The first part of the ceremony occurred when the ship’s company delivered the Mauri (life force) to the Te Taua Moana Marae. At morning colours at 8am the Maritime Component Commander’s broad pennant was flown from the main mast. This meant that in the afternoon Kahu was the flagship. At middy the ceremony was begun and the White Ensign, New Zealand flag and the commissioning pennant were lowered for the last time. These were carefully folded and handed to the Chief of Navy. P.Y. Dennerly, Ships Badges of the Royal New Zealand Navy, Auckland: Royal New Zealand Navy Museum, 1997, p. 25.